The report viewer control depends on server-side processing for report rendering. So, you should build the WebAPI service that is compatible for report viewer. This getting started will illustrates details of how to create the report viewer compatible Web API service also for your application. Refer the installation page to know more about the basic steps to configure the Syncfusion components to use with ASP.NET Core application. NuGet package reference will be mostly preferred with ASP.NET Core development to setup the environment without installation, if you missed to explore then refer to the nuget-package-manager-settings to configure the Syncfusion NuGet source. Ensure whether all the necessary dependency scripts and style packages are included within the bower.json file as mentioned here, so that the required scripts and CSS will be installed and loaded into the mentioned location (wwwroot -> lib) within your project. ej-script-manager must be defined at the bottom of the _Layout.cshtml page. Syncfusion.EJ Builds the report viewer controls with the tag helper. Syncfusion.EJ.ASPNET.Core Builds the report viewer controls with the tag helper. Syncfusion.EJ.ReportViewer.ASPNET.Core Builds the server-side implementations. Syncfusion.Report.NETStandard It is a base library for the Syncfusion.EJ.ReportViewer.ASPNET.Core package. Syncfusion.Compression.NETStandard Supports for exporting the report to PDF, Microsoft Word, and Microsoft Excel format. It is a base library for the packages Syncfusion.Pdf.NETStandard , Syncfusion.DocIO.NETStandard and Syncfusion.XlsIO.NETStandard. Syncfusion.Pdf.NETStandard Supports for exporting the report to a PDF. Syncfusion.DocIO.NETStandard Supports for exporting the report to a Word. Syncfusion.XlsIO.NETStandard Supports for exporting the report to an Excel. Syncfusion.OfficeChart.NETStandard It is a base library of the Syncfusion.XlsIO.NETStandard package. Newtonsoft.Json Serialize and deserialize the data for report viewer. It is a mandatory package for the report viewer, and the package version should be higher of 10.0.1 for NET Core 2.0 and others should be higher of 9.0.1. System.Data.SqlClient This is an optional package for the report viewer. It should be referred in project when renders the RDL report and which contains the SQL Server and SQL Azure datasource. Also, the package version should be higher of 4.1.0 . It is necessary to define the following namespace within the _viewImports.cshtml page to initialize the report viewer component with the tag helper support. You can use the tag to add the report viewer control. For an example, the Index.cshtml page can be replaced with the following code by removing the existing codes to add the report viewer. The Web API service should be mapped with the report viewer report-service-url as shown in the above example code. You should inherit the IReportController interface to build the report viewer compatible Web API, and the ReportHelper should be used with IReportController interface implemented methods. The ReportHelper will perform the server-side related process and will return the required data for the report viewer to process the rendering. Here, the sample code is provided with an MVC application to build the Web API service along with the existing controller. // have the rendered report viewer information in server. // IHostingEnvironment used with sample to get the application data from wwwroot. // Post action to process the report from server based json parameters and send the result back to the client. // Method will be called to initialize the report information to load the report with ReportHelper for processing. // Here, we have loaded the sample report report from application the folder wwwroot. Sample.rdl should be there in wwwroot application folder. // Method will be called when reported is loaded with internally to start to layout process with ReportHelper. // Method will be called from Report Viewer client to get the image src for Image report item. You cannot load the application report with path information in ASP.NET Core. So, you should load the report as Stream like an example provided above in OnInitReportOptions. 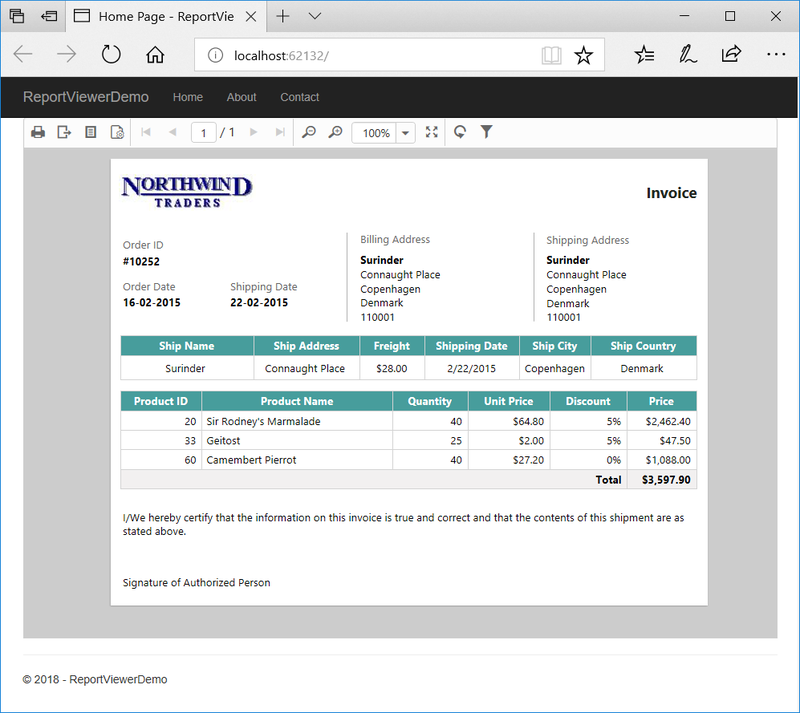 If you need to get the invoice sample report then you can obtain it from the Syncfusion ASP.NET Core sample browser installed location (wwwroot\reports\invoice.rdl).